Amarylis Hotel (C Class) offers 6 furnished studios and 10 furnished apartments, each with a private bathroom with shower, hot water and a balcony. 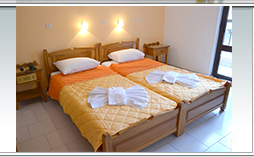 9 of our studios and apartments have a view to the Karpathian sea and villages. Each of our studios and apartments has a refreshing air conditioning, TV set, and kitchen facilities (kitchenette). The lounge with cozy sofas and relaxed decoration, will give you the possibility to unwind and enjoy drinks and refreshments available from our bar. Our Hotel is approved and certified by the Ministry of Tourism and the Greek National Tourism Organization. For any additional service or equipment our guests might need, the efficient and friendly reception staff will always be ready to help, making your stay with us memorable. We also offer free transportation from the main port of Karpathos to our hotel. From Karpathos main harbor guests can easily find us as we are right next to the taxi station in the center of Pigadia town (5 minutes walking from the harbor). Please get and use the map provided to guide your self. Click here to	get the map. Free wireless internet is also available in our hotel. Getting to Amarylis Hotel from Karpathos main airport can be done with a taxi by dropping you at the taxi station located at the capital of Karpathos and right next to our Hotel. Also by calling us, we can arrange a taxi to wait for you at the airport.